If you don’t own a bread machine or want to go through the manual yeast ritual, quick breads are a breeze to make. What makes the bread “quick” is the addition of baking soda and/or baking powder in the stead of yeast. 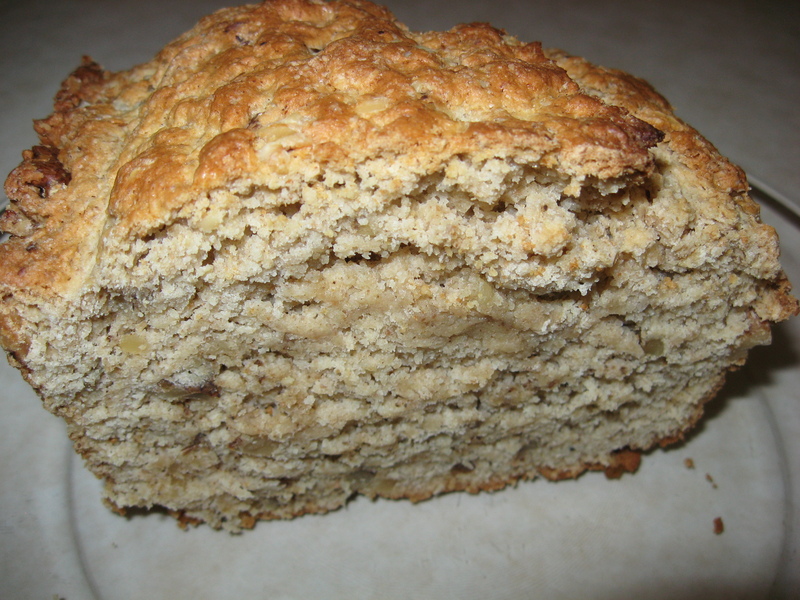 There are a huge variety of quick bread recipes including Corn Bread, Boston Brown Bread, Onion Pan Bread, Irish Soda Bread, Banana Bread, Whole Wheat and Molasses Bread, and Nut Bread. I happen to really like the Nut Bread. The trick with quick breads is to do just the opposite of what you do with a yeast dough; you mix it as fast and gently as possible and then bake it. If you handle it too much, it tends to make for a tough loaf. So, don’t worry about a mixture that is lumpy—just make sure that there is no more visibility of the flour in the mix before pouring into your loaf pan. In a large bowl, mix together the dry ingredients—I use a whisk to do this-and add the chopped nuts. In a smaller bowl, whisk the melted butter, milk and egg till well blended. Make a well in the middle of the dry ingredients and add the liquid ingredients folding and stirring quickly and gently till you can’t see any flour anymore. The batter should be lumpy and not smooth. Place the batter in the pan and bake for about 45 to 60 minutes. Mine usually gets done in 45 minutes. A toothpick inserted in the middle should come out clean. Cool on a rack for 10 minutes before removing from the pan. This freezes just fine and it also toasts nicely. Adding a bit of raisins or currents, chopped dates, etc. can make a nice addition along with 1 tsp. vanilla and some ground cloves. You can use your imagination here.